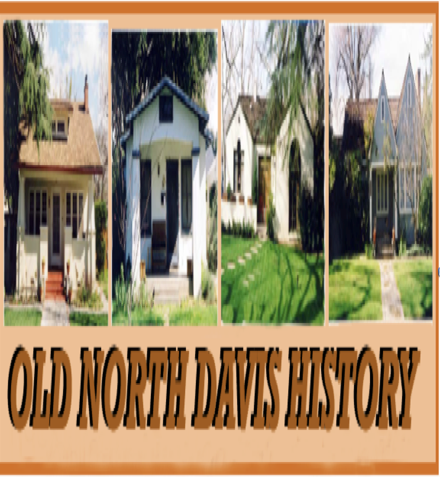 In studying Davis history, I have sometimes puzzled over what the detailed stories of various organizations actually were, including those of even the best known and longest existing entities, such as the Community Church, the Masons and the Davis Enterprise, as well as shorter-lived but key institutions such as the Buena Vista Hotel, the original Varsity Theater, the Davis Joint Grammar School, and Harby’s Meat Market--among a great many others. 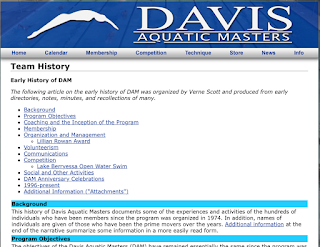 There is, of course, at least some information available on these and other organizations. For a few, there are even fairly detailed accounts. But, overall, the record is sparse. The consequence is that our picture of ordinary Davis life fifty, a hundred, or more years ago is fuzzy and faded. The simple fact is that no one kept detailed records on organizations, or, if they did, those materials have long since been thrown away for want of storage space or for other reasons. But, in recent years, all that has begun to change. 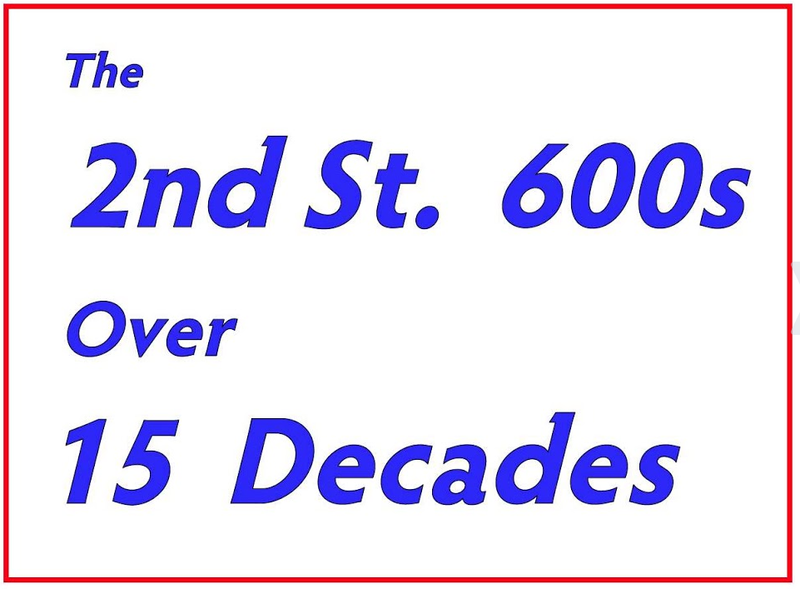 We are living at the start of a new era of compact and detailed organizational record keeping. We see this in two forms. 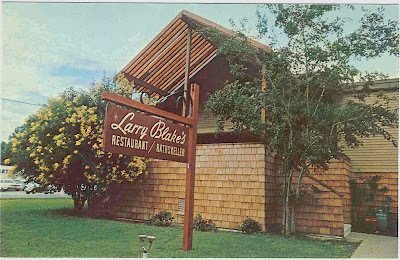 Virtually all Davis history postcards have been identified and collected by the half a dozen or so people who work at that arcane hobby/obsession. Indeed, a good part of the interest in collecting such cards resides in the rarity of new finds. As one of those hobby/obsessives, I was therefore jolted when I came onto the card reproduced here, which I had never seen before. 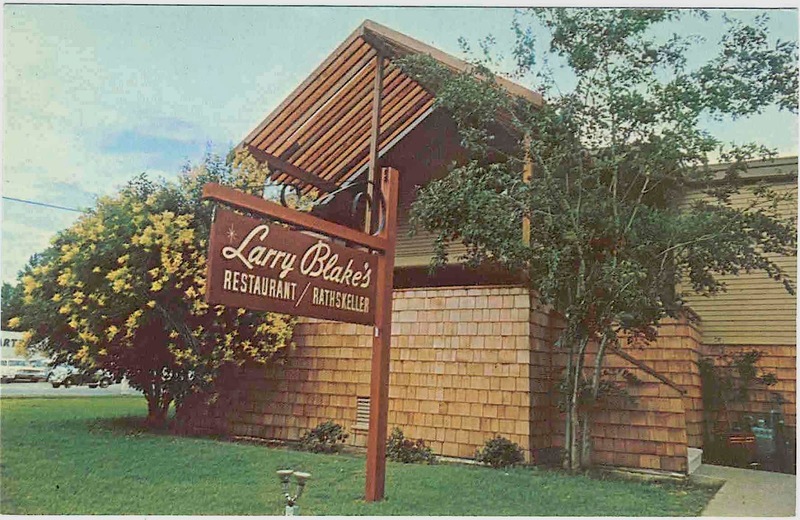 It is an apparently 1960s image of Davis’ Larry Blake’s. The view in the front side of the card, Image 1, seems to be from First Street looking northwest, with the equipment and truck rental firm there at the time visible across F Street on the left. Just over 20 years ago, City of Davis staff teamed with volunteer tree activists to produce a pocket-size booklet titled Downtown Tour of Landmark Trees. I reproduce it here. 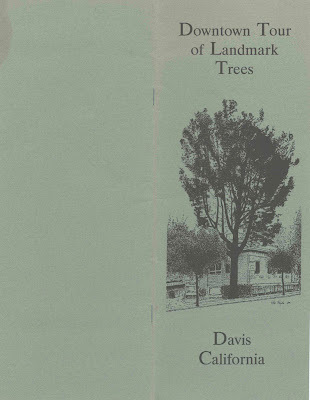 One can see that it chronicles the locations and features of 16 trees in the new University City “Downtown” that have survived from the Ag Village and College Town eras. 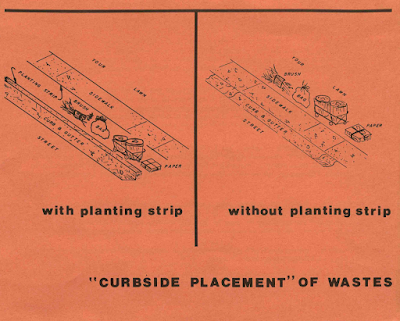 It is also true, I think, that it would no longer occur to anyone that a booklet of this sort was a good idea or even possible to produce. The resources and will for such work have ebbed and civic energy has turned in other directions (cf. 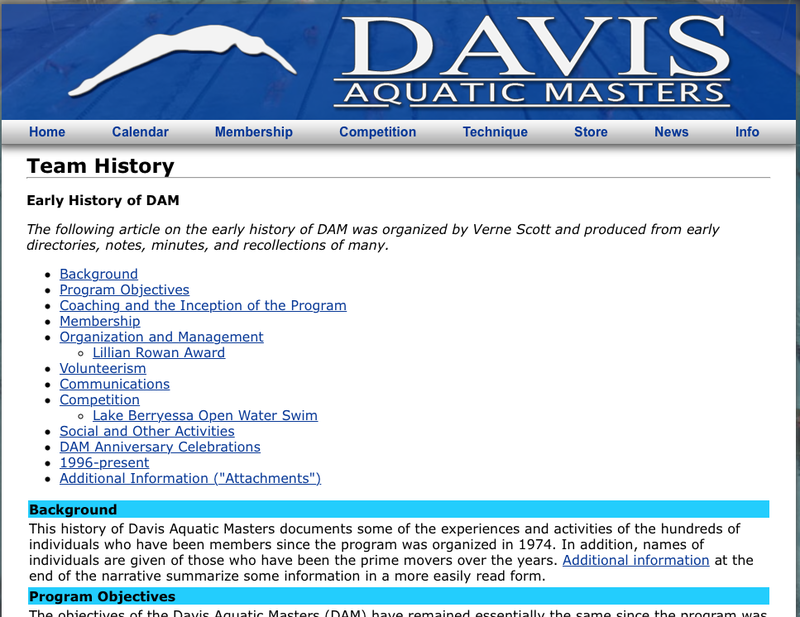 http://www.davishistorytoday.org/2014/06/davis-enterprise-traces-history-of.html ). 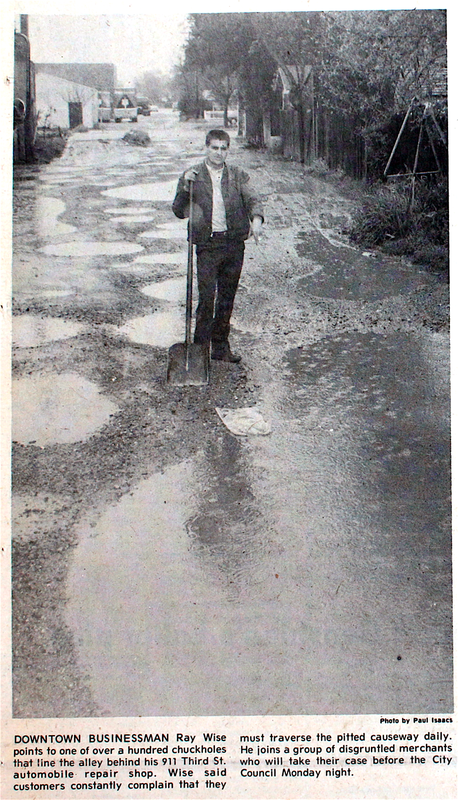 Rummaging through the 1974 Davis Enterprise I happened onto two images of potholes in downtown alleys that I thought might provide a little perspective on current concerns about the state of Davis’ infrastructure. Image # 1 looks north from the south end of the railroad/I street alley as it intersects with 3rd street, just behind the viewer. Fourth Street is in the middle distance. In Image # 2, the viewer is also looking north in that same alley, but the view is now just south of Fifth street in the near distance. The former Dairy Queen building (now Indigo Hammond + Playle Architects) is visible above the white pickup truck on the left. In the Spring of 1974, City of Davis staff quietly developed and the City Council adopted a policy to “no longer pick up yard refuse placed in the street,” thus planning to end a popular practice of many years standing. 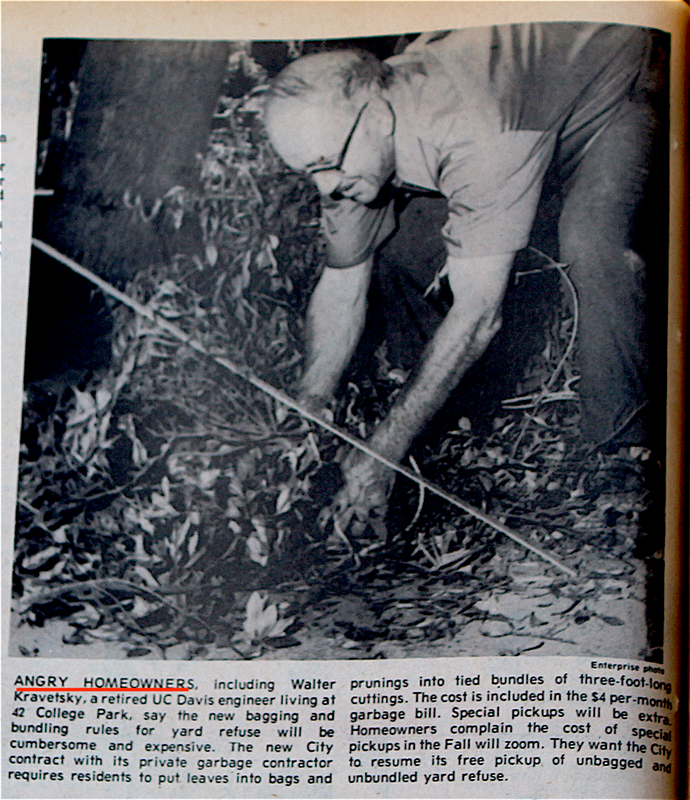 As this ban was about to go into effect on July 1, residents became aware of it and vigorously protested the onerous new requirements to containerize, to “bundle,” or to make arrangements for extra-cost pick-ups of yard refuse. 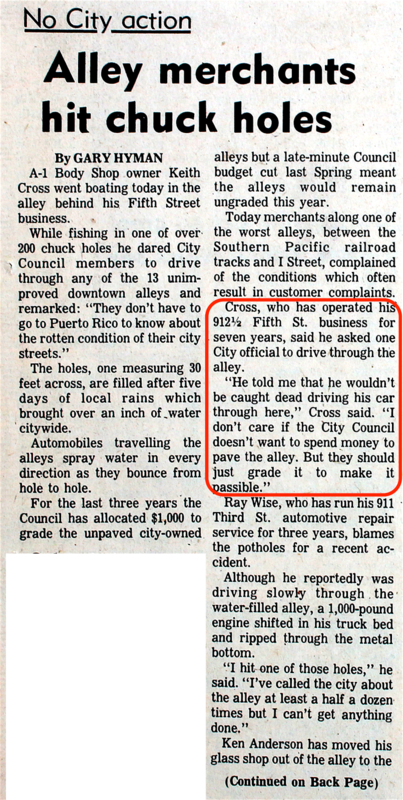 The City Council met Monday evenings and over the course of the three meetings of July 1, 8, and 15 assertive citizen crowds backed down and then reversed the Council. 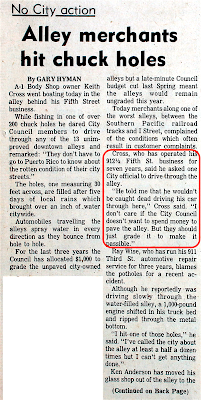 I think it is of interest to know that the heavy-footed and out-of-touch City Council behavior we see in this episode emanated from the second cohort of the famous “revolution of ‘72” City Council. 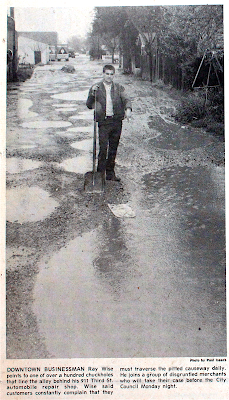 The historic trio of Joan Poulos, Bob Black and Richard Holdstock were in their third years on the Council and Jim Stevens and Tom Tomasi had just joined them. I guess it goes to show that Davis-style “progressives” can govern as ineptly as anyone else.